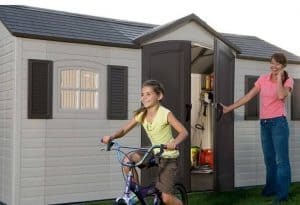 The 15′ x 8′ Lifetime Heavy Duty Plastic Shed is one of the most impressive and distinctive sheds that you will ever see. Anyone who comes to your home is going to be impressed with how great the exterior looks and then be truly amazed when you open up those large double doors and show off all of the space that this has inside. 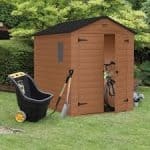 This is a shed that will not only offer you somewhere to store your belongings, but it will also really stand out and be the prominent feature of your garden. Those large double doors, the two windows and that fantastic looking roof make this look every bit as high quality as the materials that have been used to build it are. 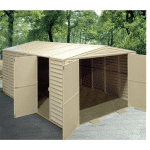 The shed is made from the finest high density polyethylene. A galvanised steel frame is supporting the double walled panels to give you a truly strong and reliable shed that is going to last for many years. Once built this is a shed that is very low maintenance and will just require the occasional wipe down to keep it looking fantastic. A ten year guarantee will give you peace of mind, knowing that this is going to be standing strong in your garden for a very long time. This is a shed that is so spectacular in its appearance that it is pretty much impossible not to have to pick your jaw up from the floor the first time you see it. 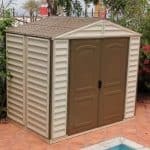 The 15′ x 8′ Lifetime Heavy Duty Plastic Shed is a more luxury type shed that would be perfect for those of you who want to add a lot of storage space to your garden, but do it in a way that really stands out. 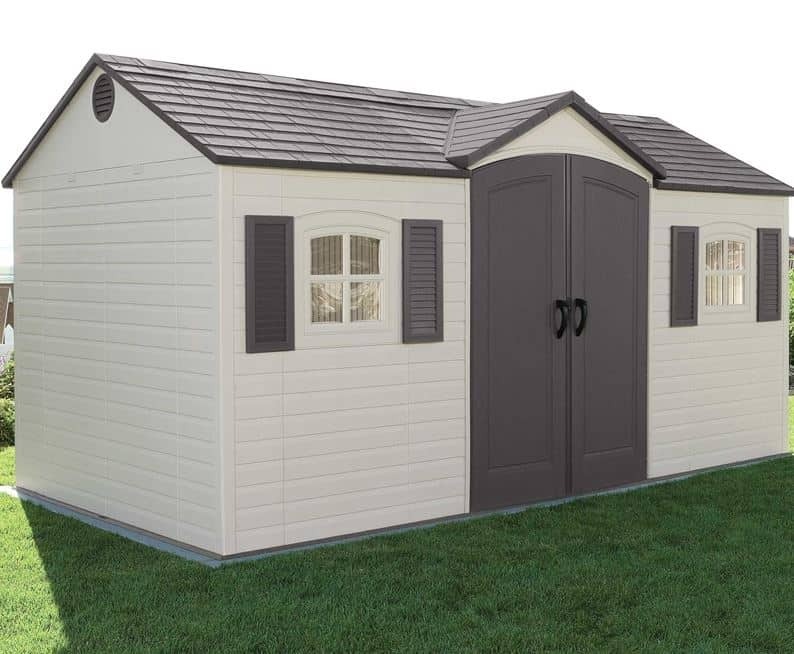 This shed is offering you a very impressive, 14 feet 8 inches of width along with 7 feet 10 inches of depth. The first time you open up those doors and take a step inside, you really are going to be amazed at just how much room is in here. The height of this shed is also something that impressed us greatly. Along the ridge you have 8 feet of height and even at the lowest point along the eaves the shed is still 5 feet 11 inches high. Lifetime have gone for an apex style roof and honestly for a shed this size that is exactly the kind of roof that you would want. Rain will not be sitting on top of here trying to find a way in, it is always going to just roll right off. The roof is made with 20 mm thick, high density polyethylene which is supported with a galvanised steel frame to make it very strong. The roof thanks to the way it has been moulded looks very nice and at a glance you may think it is actually made from slate. We are really loving these plastic based sheds that we have been seeing lately and the 15′ x 8′ Lifetime Heavy Duty Plastic Shed is one of the strongest that we have looked at yet. 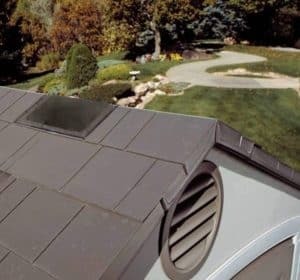 The walls are double walled high density polyethylene which is the same type of material used for the roof, but given a little bit more strength. 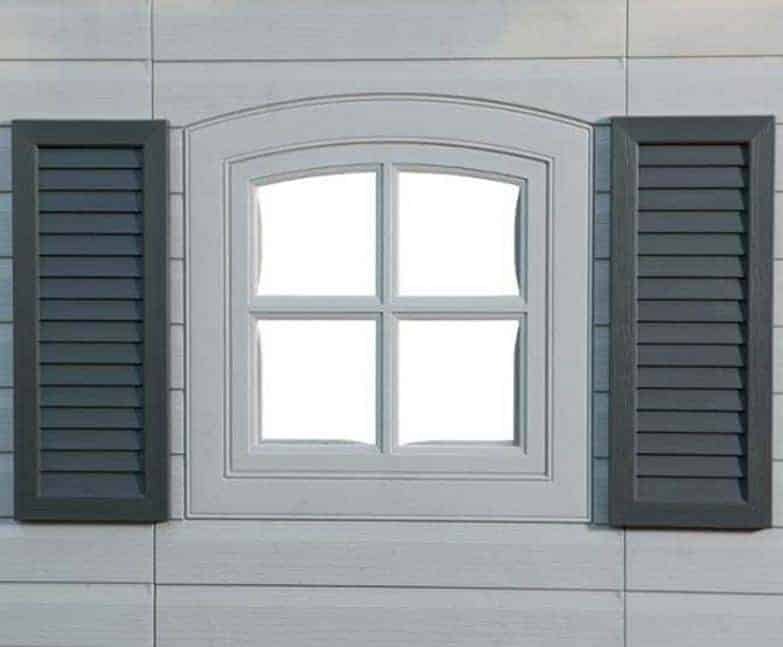 These walls are an incredible 40 mm thick and have been moulded in a way that gives them a shiplap cladding type of look and we think it does give the shed a very modern and high class style. The already strong double walled high density polyethylene panels are supported and kept in place with a galvanised steel frame. This frame is excellent and will never lose its shape or strength, giving you years and years of service. A large shed such as this simply must be well built and this frame is one of the strongest we have seen in a shed made from materials like this. The flooring is made from that same high density polyethylene as the rest of the shed is and it is a very good thickness to ensure that the shed can handle storing a great deal of items and take the weight of you walking around inside or even working in here. This type of flooring is much easier to clean than a traditional wood flooring and that is something which we really do like about it. We think one of the reasons that sheds made from plastic are becoming so popular is because of how low maintenance they are. There is no yearly treatment required here, actually there is no treatment at all required. Once built, you only have to worry about washing the dirt off which can be easily done with a bucket of water or even with the hose. Looking after this shed could not be any more simple which is ideal if painting a shed once a year is something you would hate to do. 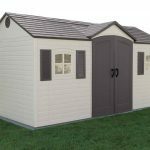 The ten year guarantee that Lifetime give you with the 15′ x 8′ Lifetime Heavy Duty Plastic Shed shows you just how confident they are in the design and the materials that have been selected to make this shed. The double doors on the shed are very impressive and we think resemble doors like you would see on a large barn. Each door has a solid handle to make opening them up easy and they are held in place with some top quality hinges. Once open the doors give you plenty of room to get in and out of the shed. 6 feet 4 inches is the height and 4 feet 8 inches is the width. Putting a set of large shelves or storing a mower inside here would be no trouble at all. One thing we really love about this door in addition to how practical it is, is just how great it looks. There is this very lovely little apex over the doors which really does catch you eye. There are two good sized windows on the shed. There is one on each side of the door and they both can open. 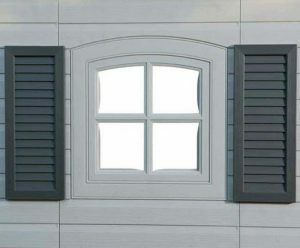 The windows open up wide enough so that you can get a lot of fresh air inside. Actually speaking of fresh air there are two air vents on the shed so that if you are working in here it is not going to feel too hot and stuffy. 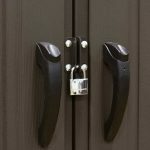 We are very pleased with just how durable and secure this shed is and if you want to really step up the security of it then those door handle can have a padlock added very easily. If you are intending on keeping expensive things inside here we would actually suggest getting a padlock. Despite the two large windows this is still a rather private shed. Still adding a set of curtains or blinds would give you a lot more privacy. As amazing as these types of sheds are and as much as we really do love the materials they do not offer any way to customise them. But when you have this much space to play with on the inside to really make it your own then we feel not being able to do anything to the outside does not really matter. 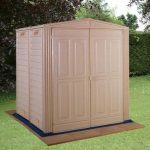 No extras are required for this shed, Lifetime do offer an anchor kit to keep it securely placed to the ground, but if you are storing a lot of items inside here then you will not need to worry about that as that will weigh it down anyway. This is one very top of the line shed. 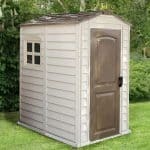 The price we know is up there, but for your money you really are getting a shed that is high quality in every way. You have nothing to worry about here. This is a shed that will last you for many years and we are sure for lots of people it is going to be the only shed they ever buy. The amount of space you have in here is really just incredible and we are sure filling it all up is going to be a lot of fun. This is going to take a while to get built. We recommend making sure you have a friend help you and to make sure you take regular tea and biscuit breaks. This is an expensive shed we will not lie, but at the end of the day you are getting what you pay for here. This is high quality all the way and is going to last you for lots of years so we do feel it offers good value for money. Final Thoughts: The 15' x 8' Lifetime Heavy Duty Plastic Shed is something that really did make us say wow the first time we stood in its presence. It is just such a fantastic looking shed that it is impossible not to be impressed with how good it looks and the huge amount of storage space it offers. We know that for most people the price is on the high side, but we feel if you can save up for a while and are willing to take the plunge on this shed that you will be very happy with it and have a shed that is going to last you for a long, long time. I think that this shed is the one for me, however as you say it is rather expensive and it is a shame that it only comes in one colour. It is my intention if things go to plan, to purchase said shed in June of this year. When I move to Devon I hope it can be delivered free of any further charge and that the ground securing pegs can be included in the overall all inclusive price. ? Hi Chris, thanks for the comment. Most retailers do offer free UK shipping and Devon is usually within that catchment area. Do you have this shed with 2 entrances ? also can you arrange delivery to Jersey Channel Islands, also we do not pay VAT in Jersey, please give me a price if you do stock one with 2 entrances. plus delivery dates ? Hi Sue, the plastic sheds are usually pretty inflexible when it comes to moving bits around and customising them. I think you might be better looking at pressure treated wooden sheds. Forest Garden Buildings sold via ShedStore might be your best bet. do you have an assembly service by chance? Hi Nick please contact the retailer directly to ask this question.